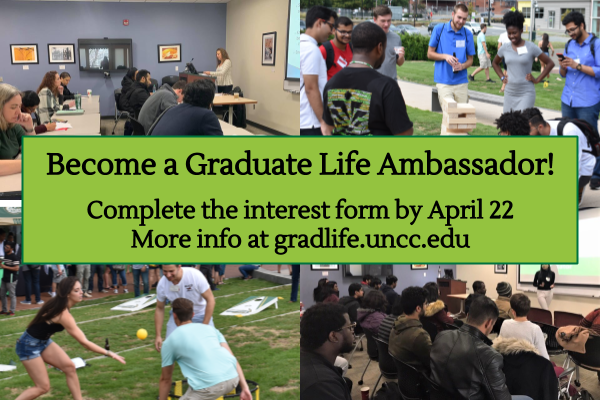 The Center for Graduate Life is excited to announce the NEW Graduate Life Ambassador (GLA) program! This new initiative established by Dr. Jill Huerta, provides particularly self-driven, motivated and responsible graduate students with the opportunity to grow their career development skills and professional network. This role is a great precursor to the Graduate Life Fellow position! Interested? Just fill out this form by April 22! For questions contact the gradlifecenter@uncc.edu. Any graduate student in good standing with the Graduate School can apply. Graduate students are welcome to reserve the CGL for their student meetings or study groups. Please contact us at GradLifeCenter@uncc.edu for additonal information.